Pernod Ricard’s Jameson Irish whiskey will continue its annual St Patrick’s Day activities again this year with another limited edition bottle design; this time created by ornamental glass artist David A Smith. The limited edition bottle, the second in a series of annual releases by different artists, will be available in the off-trade, on-trade and travel retail (Dubai and key airports in Europe) from March. 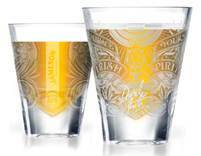 David’s bottle design was inspired by the ornate and intricate glass etching and gilding found in Dublin pubs and reflects the classic back bar mirror. It also introduces the message ‘Embrace Your Irish Spirit’ with the depiction of trumpets and streamers to capture the celebratory mood of ‘St Patrick’s Live’ in Dublin.To support the on-trade launch of the limited edition bottle, a limited edition shot glass featuring the David A Smith design is available. In addition to building awareness and consideration for the new bottle in the off-trade, Jameson has created in-store secondary display units and window displays, while POS material and two neck tags create additional stand-out on-shelf and increase consumer engagement. One necktag includes a QR code, which directs consumers to jamesonwhiskey.com where they can access information on the limited edition bottle. The second offers consumers the chance to win a trip to Jameson ‘St Patrick’s Live’ in Dublin. The Jameson St Patrick’s Day OOH campaign is focused on key drinking circuits in London – Old Street, Angel and Clapham. The campaign commenced on the 4th March and will run until the 25th March 2013. Over 3,000 branded kits will be distributed nationally with a focus on London, Liverpool and Manchester, including Jameson hats, bunting, tent cards, posters, drip mats and bar runners within which the Jameson Ginger Ale serve will be promoted. Jameson will be working closely with over 2,000 managed retail accounts to create bespoke solutions, ranging from 2 for 1 offers, POS in outlet, discounted drink offers and consumer promotions. The brand is also planning to run the Jameson Society during March and April. The brand will also be liaising with accounts on the Jameson ageing barrels, whe reby Jameson will provide 3L barrels for the establishment to age their own cocktails. To support this Jameson has created the Lucky Barrel Facebook App to drive awareness and participation. Players select a barrel to add to the Jameson cellar and are encouraged to invite their friends to play. Barrels are picked at random and the owner of the chosen barrel wins a prize. A Jameson Live Broadcast will take place on March 17th and will see radio stations from around the world descend on the Old Jameson Distillery in Dublin to broadcast live to their listeners back home. On the day itself, Jameson will once again host a series of St Patrick’s Live parties around the world.